Andy Stephens is the Chairman of Peaksware Holdings. He lives in Milwaukee, Wi. 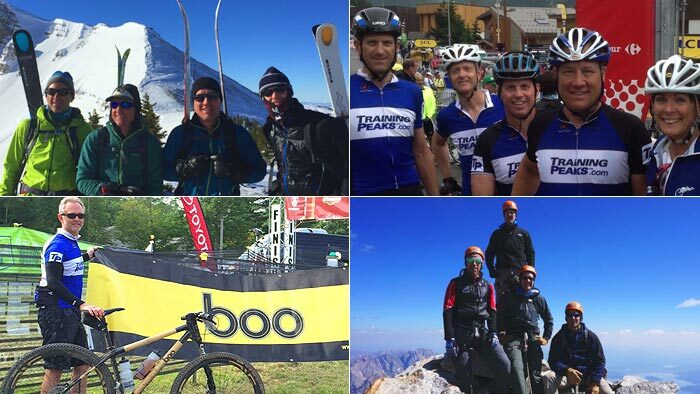 and trains for what he calls “adventure challenges.” In this article, he explains how he came to find the right balance of committing to an event, using metrics, and working with a coach to not only improve, but to have fun doing it. Now in my 50’s, I’ve done enough events of varying types and distances to understand where my interests lie. I’m not necessarily interested in competing with others, but I do like to push myself to meet new challenges. I also enjoy the camaraderie of being with family and friends as well as meeting new, like minded, people. I really enjoy the parties afterwards! These challenges can be as conventional as a local 10k or as non-conventional as a multi-day mountain climb. Personally, I’ve adopted an adventure sport lifestyle that I find very rewarding. When I first started using TrainingPeaks over a decade ago, I had a coach and was following a regimented training plan. I was trying to get faster and stronger and it seemed like the right approach at the time. Although many TrainingPeaks users follow exactly this same approach, it ended up not suiting me very well. After a while, completing the workouts and uploading the data felt more like a chore than a positive habit. So I took time off and freelanced on my own. That didn’t work very well either. What I noticed was that the variety of my workouts became quite repetitive and there was no real accountability to complete them either. I was limited by my own imagination and my own internal commitment. By mistake, I hit on what has proved to be a magic formula for me. I accepted an invitation from Dirk Friel and Gear Fisher, the Co-founders of TrainingPeaks, to travel to France and ride one of the classic climbs in the Tour de France, the Alpe d’Huez. I talked a friend into doing it as well so now we were both committed. From that point on, the accountability issue took care of itself. We had a specific date that we needed to be prepared for. But I still had the issue of how to train for the ride. My life is busy just like everyone else’s. I have four children, a job, and responsibilities. How do I know how much training is enough so that I can accomplish my goal but not so much that I end up spending precious time overtraining? In the case of my original Alpe d’Huez attempt I took a fairly haphazard approach. I looked up the course and made note of the distance and the inclines at various sections. I asked friends how hard it would be and how fit I would need to be. My research provided me with mostly subjective answers. In return, I did mostly subjective training. I found some steep hills in my area and did hill repeats. I rode with friends in group rides. I trained based on how I felt and was not to diligent about recording my data. Needless to say, the last hour of my climb in France was pretty miserable. I made it and was of course happy and willing to celebrate, but I knew there had to be a better way. Since that time I’ve done a lot more what I call “adventure challenges”. Things like mountain climbing, backcountry ski tours, mountain bike races, etc. I enjoy them immensely and feel like I’m getting much better at preparing and participating in them. Here’s how I use TrainingPeaks to be fully prepared and ready to perform. First, I do use a coach. I don’t think it’s a requirement by any means, but I find it very valuable. I do it mainly because I value the expertise and relative to the number of hours I put into training, (making some assumption for my “hourly rate”) his fee is not outrageous. The value of having a nearly perfect daily prescription of workouts to follow is worth it to me. Left to my own planning, my workouts would lack variety, I would quickly get bored, and most likely my fitness would not progress as efficiently either. I know because I’ve tried in the past. With a coach I don’t waste time, which is valuable to me. I’ve never tried buying an off the shelf training plan, but I know they work well because many TrainingPeaks users follow that approach too. Second, I’m a zealot about two metrics in the TrainingPeaks system- Training Stress Score (TSS) and Chronic Training Load (CTL). I’m not an exercise physiologist so I won’t try to explain the science behind these numbers. I’ll just say how I think about them and how I use them. I think of TSS as the effort for me to complete any individual event (workout, race, etc.) at a given level of intensity, with the maximum being 100 points for a 60-minute all-out effort. So every minute of a maximal effort is one and a half points, every minute of a moderate effort is one point, and every minute of an easy effort is half a point. A typical 45 minute tempo run would be about 45 to 50 points. A hard 30 minute run could also be 45 to 50 points. Intensity and duration are the key variables. The really great thing about TrainingPeaks is it calculates all of this for you if you set accurate heart rate, pace, and power zones and you’re good about uploading your workouts. With the new generation of watches and phone apps, uploading your data is a complete no-brainer. Depending on the workout, I use either a Garmin watch and strap, or the Wahoo app and strap. For workouts when you don’t have a device to collect the data you can still make an estimate. Just take the total minutes times your perceived exertion (a 60 minute gym workout for example is probably a 40-50 TSS per hour). Obviously, the more you rely on actual data rather than perceived the more accurate your score will be. CTL is simply the average of your last 42 days of TSS. I think of CTL as my fitness bank account. I need a big enough CTL balance to be able to “afford” the TSS challenge I’ve committed to do. Here’s how I think about that fitness payment. I’ve found that in order to put in a solid effort (one that you feel good about the result and you actually enjoy the experience) you can do a TSS effort that is right around three times your CTL. This also holds true for multi-day efforts so long as you eat and hydrate well and get good rest in between. Obviously, you can complete events with higher TSS demands with less CTL but, in my experience, there is a price to pay. At four times my CTL, I’ve found my effort begins to rapidly diminish by the end and it hurts. At five times, it’s a slog and you’re basically miserable for the last quarter or so. Beyond that I don’t know and wouldn’t try. What I do now is try to get a better objective measure of what my challenge is going to require. As an example, in early June I’ve committed to run a half marathon on hilly trails with a group of friends. I know on flat ground my half marathon pace would be about 8:20/mile. But on trails with steep hills it’s probably going to average closer to 10:00/mile. So I’m estimating a 2:10 to 2:20 timed effort. At maximum intensity that is most likely going to be a 135 TSS effort. So I will need a minimum of 45 CTL. As an aside, using this logic you can see why elite athletes are capable of what seems to be inhuman efforts. For example, a typical Tour de France rider probably has a CTL of 140 plus. A typical stage for them is four to six hours. At 90 percent intensity that is a TSS of between 216 and 324. Well under my three times threshold guideline. Importantly, my CTL should look like the event I plan to do. A 45 CTL made up of mostly indoor trainer rides and backcountry skiing is not going to feel like a 45 CTL made up of hilly trail runs when it comes time to do my event in June. But you have to be very careful to guard against overuse injuries, especially as you age. I like to target 20 to 25 percent of my CTL at the time of an event comes from sport specific training. That, plus the general fitness from the remainder of my CTL is usually enough to get by with. Managing this process is where an expert coach can really help. If you communicate your commitments in a timely fashion, at least 10 weeks ahead of time, your coach can begin shifting your training plan accordingly. I’ve also found it is very difficult to increase my CTL too quickly. Partly, again for risk of injury, but mainly just for life reasons. I recently got back from a week of backcountry skiing with friends. We did nothing but hike and ski for five days. My CTL increased by 20 percent but I had hundreds of emails, phone calls, and conversations with family and friends to catch up on. A steady pace wins the CTL race. With a good base in place I can normally increase my CTL by about 30 percent in 10 weeks. So there’s my formula. Figure out what activities you really enjoy doing. Commit to do one on a certain date and, if possible, convince someone fun to do it with you. Get an objective measure of the TSS payment that will be required to complete your goal in a way you feel good about. Figure out what you currently have in the “CTL fitness bank” and then map out a 10 to 12 week plan to raise at least 3 three times your CTL to pay for it. Sounds like an investment guy, right? Andy Stephens is the Chairman of Peaksware Holdings, the parent company of TrainingPeaks. He lives and trains in Milwaukee, Wisconsin.